In the discourse of the Chinese Communist Party, a “tiger” refers to a high-level corrupt official. 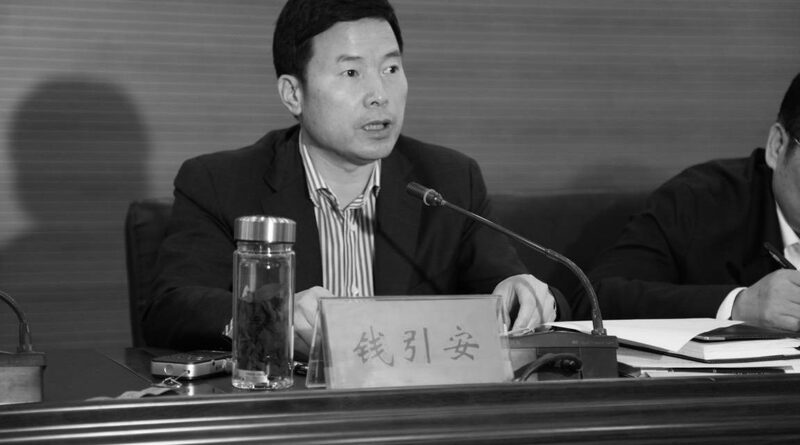 The tiger I’m writing about here is Qian Yin’an (钱引安), a top official in Shaanxi province who was placed under investigation earlier this month. And the river? The river here is not in fact a river, but a reference to Liangjiahe (梁家河), the village with the character for “river” in its name where President Xi Jinping is said to have spent his formative early years as an official more than four decades ago. Allow me to explain. 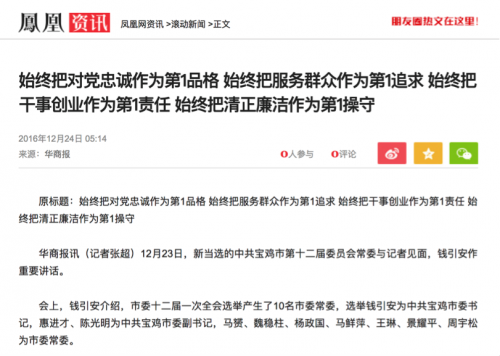 On November 1, news that Qian Yin’an was under investigation made the rounds on the internet. At the same time, another point of related interest and speculation gained some traction on social media, based on an article published back in the summertime from the very same Qian Yin’an — praising Xi Jinping in language so obsequious it turns the stomach. Qian’s essay, which ran in the Study Times journal on August 3, was called: “Searching for Liangjiahe in My Heart.” Study Times is published on a weekly basis by the Central Party School. As a cadre in Shaanxi, I have visited Yan’an many times, and I went into Liangjiahe many times. For me, each time was an exercise in refining my sense of Party nature (党性), a baptism of the spirit (灵魂的洗礼). And every time I came away with new thoughts and understanding.
. . . . . There are major teachings in those remote valleys, and those teachings contain great spirit.
. . . . . Systems of thought never come without foundations, and great systems of thought must necessarily take root in great soil (伟大的土地). In May 2017, Qian Yin’an was promoted to a ministerial level position (省部级) in the leadership, serving as a member of the provincial standing committee in Shaanxi. At that time, an article appeared online that spoke with praise of Qian’s steady rise through the ranks. At the age of 34, it said, Qian Yin’an had served as the deputy chief of a district in the city of Xi’an, later rising to a positions as a district Party secretary in the city, as a deputy major, as mayor of Baoji city, and finally as Party secretary of Baoji city. 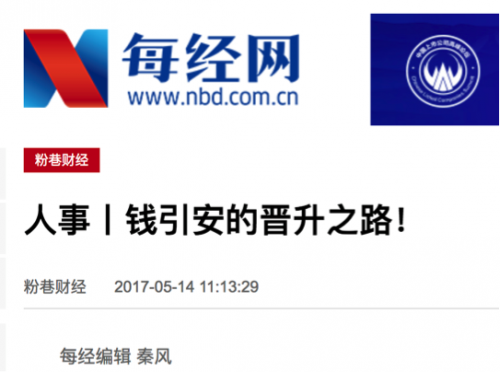 In Chinese officialdom, leaders of prefectural-level cities (地市级) and above generally leave traces in official news coverage. Qian Yin’an appeared for the first time online in 2009. The article below, which was posted to Netease but sourced from Xi’an Evening Post, shows Qian accepting his appointment as deputy mayor of Xi’an. 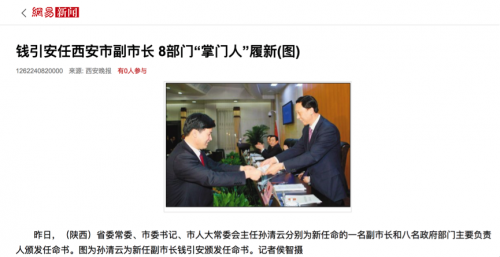 The August 2011 article below, sourced to the China Business View but appearing here at People’s Daily Online, talks about how then deputy mayor Qian Yin’an invited other Xi’an city officials along with him on an undercover inspection tour. 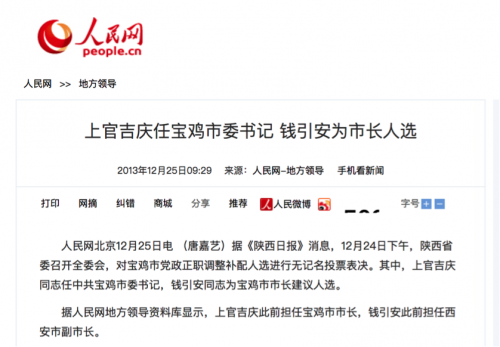 And here is the announcement on Christmas Day in 2013 of Qian’s appointment as major of Baoji. From 2009 to his fall from grace this month, Qian appeared five times in the People’s Daily. Since 2014, his name has appeared in 198 articles in newspapers across the country, some of these announcing his name among the appointment of delegates to the 19th National Congress of the Chinese Communist Party. His name appears in the headline of 52 articles. Doing a simple analysis of these reports, we can gather that Qian Yin’an has a knack for following along. His speeches and articles are peppered with whatever political buzzwords are trending at that moment, phrases like “mass line” (群众路线), “strict governance of the Party” (从严治党), the “four consciousnesses” (四个意识), and so on. In fact, “resolute preservation” is just a favored slogan of Qian’s. Back when he was serving as a district chief in Xi’an, luxury property developments went up in an area of the Qingling Mountains under his jurisdiction that was supposed to have been ecologically protected. In recent years, Xi Jinping repeatedly asked in written comments that these developments be investigated, but these instructions were impeded. It is generally believed that the umbrella of protection over the luxury development case has been Qian Yin’an. 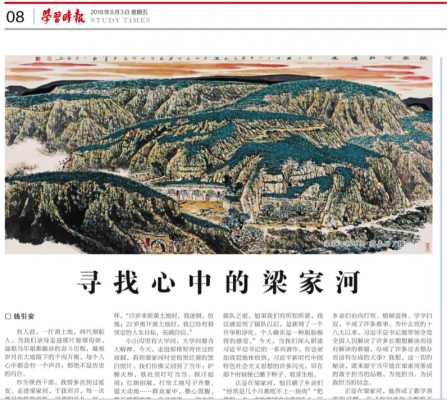 In late July this year, under pressure from the Central Committee, Shaanxi finally began dealing with the issue of the illegal developments in the Qingling Mountains. 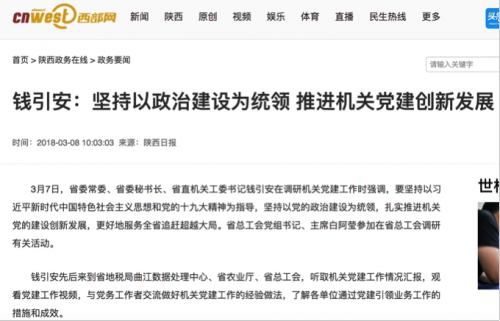 And it’s significant to note that the Qian Yin’an article about the lessons of Liangjiahe was published in the Study Times just three days after a special conference was held to address the question of the illegal developments. Could this have been a coincidence? Possibly. 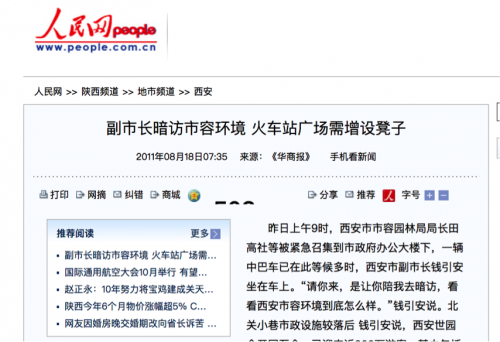 But it is also possible that Qian’s article was intended as a form of disaster management. In China, red and black — meaning loyalty to the Chinese Communist Party and corruption — are often two sides of the same coin, and when things turn difficult politically, the tigers know that the surest form of protection is to wrap themselves in a mantle of red. The timing of Qian’s August paean to Xi Jinping is most definitely food for thought. I hope that the Study Times comes clean with the process of how and when the article was submitted, which might tell us a great deal about how messy politics can become within the official Party media. 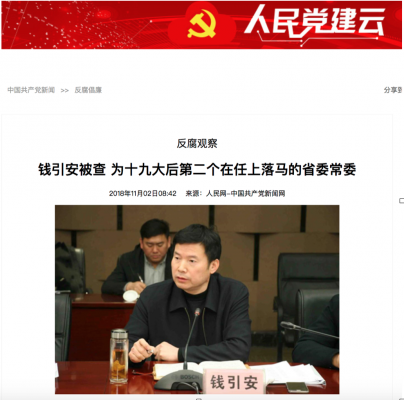 Three months after Qian’s article in the Study Times, this was the news as announced on the website of the Central Commission for Discipline Inspection (CCDI): Qian Yin’an, a member of the Party Committee of Shaanxi province, was now under investigation for corruption. NextPolitical Grilling for College Entrance Exams? 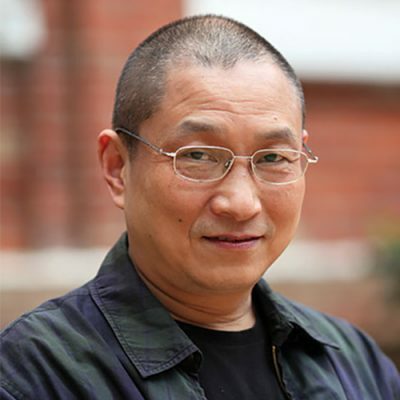 Qian Gang is a veteran Chinese journalist and media scholar whose career spans the reform era. Starting his journalism career in the late 1970s at a reporter for the People’s Liberation Army Daily, Mr. Qian was later managing editor of Southern Weekly, a leading mainland newspaper known under his tenure for its independent streak. He also is one of the founders of China Central Television’s News Probe, a weekly investigative news magazine. Qian Gang’s award-winning book, The Great China Earthquake, an account of the earthquake that struck Tangshan in north China in 1976, remains a landmark work of reportage and is required reading for Hong Kong secondary school students. Mr. Qian’s current interest and expertise focuses on the evolving political discourse of the Chinese Communist Party as revealed through official state media.